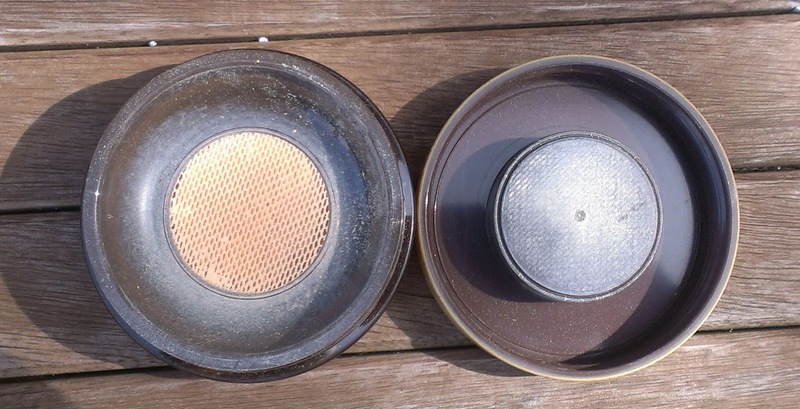 Since my skin has become drier as I've gotten older, finding a mineral or powder foundation that cooperates with it has definitely become a challenge. They can cling to flaky patches, make my skin look super dull, or just plain look powdery and ashy on face. In other words, not attractive at all. That's why, for the most part, I the powder foundations for spring and summer when my skin is more oily and I'm prone to sweating because they're just a better fit then. I do occasionally wear them in colder months over a liquid or cream foundation when I really want full coverage. Typically, I like loose powder foundations better than pressed versions because they're usually lighter in texture so they don't look so heavy on the skin. That's why I intrigued when I saw that Tarte was coming out with a loose powder foundation -- the Amazonian Clay Full Coverage Airbrush Foundation. As a brand, Tarte just speaks to me and I'm rarely disappointed in their products, so I'm always willing to take a chance on their new stuff. Still, I had some reservations about the new foundation. It's another product in their Amazonian clay line and while I think their Amazonian Clay Full Coverage (liquid) Foundation is a very nice product -- the fair shade is the best color match I've ever come across in a foundation for my skin -- I find it's a much better option for oily skin than dry. In general, clay is an ingredient typically used in products for oily skin because it can help soak up excess oil and keep skin shine-free. But those doubts didn't stop me from ordering the foundation as soon as it was available before I read even a single review. Right now, the Amazonian Clay Full Coverage Airbrush Foundation is exclusive to QVC and they're selling it with a brush designed specifically for use with the powder -- the Airbuki Foundation Brush. 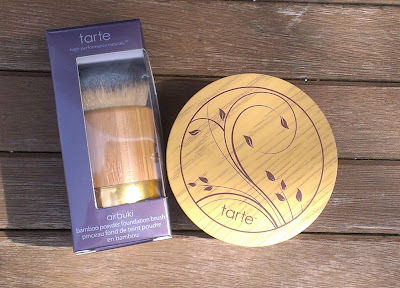 Like some of Tarte's other products, the foundation comes in pot that features a bamboo lid with a cute vine design. 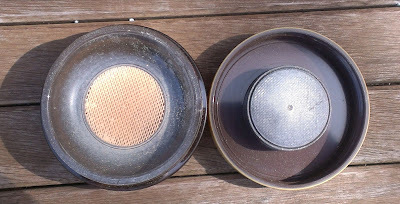 Unlike other loose powder foundations that typically feature a sifter with a few small holes for shaking out the powder, it has a neat, little piece of mesh that gives when you press the brush against it so it deposits powder on the bristles without having to make mess inside the container. The Airbuki Foundation Brush has a bamboo handle and features a flat top that works perfectly with the design of the foundation's mesh-like sifter. The bristles are nice and dense, but there's some give to them so it doesn't deposit too much powder. And oh my goodness, is it soft! It's one of those brushes that you'll find yourself rubbing against your skin even when you're not applying foundation because it just feel so nice and velvet-like. As for the foundation itself, I have to say, I really like the formula. Even if I would quibble with its name. I don't think it's a full coverage foundation -- if that's what you're looking for, you'll definitely be disappointed with this product. I would call it a light to medium coverage foundation, though you can build it up fairly easily without it looking cakey or powdery. It has a satin-y, almost glowy finish on the skin, which definitely makes it stand out from other powder foundations that tend to have a matte finish. Don't let the glowy description scare you off if you have oily skin, though -- the effect is very subtle and really just makes it look natural and fresh on the skin more than anything else. Of course, I ordered the foundation in Fair, which I found to be an ideal match for my super pale skin. 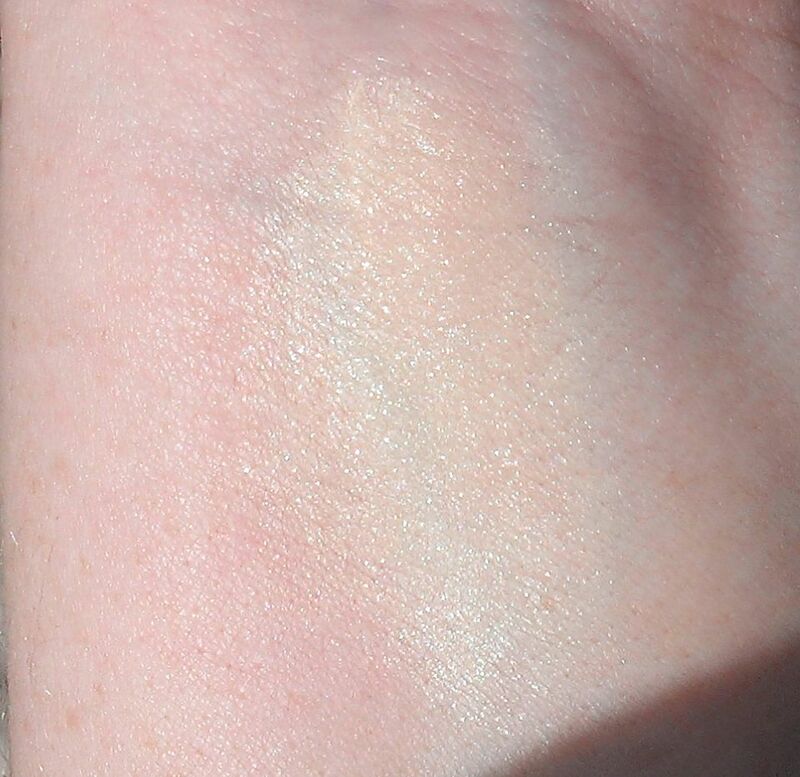 The lighting in the swatch photo below is a bit off, but hopefully you'll get an idea of what the shade looks like. Personally, I like to wear it over a tinted moisturizer or BB cream to boost the coverage slightly. I think the Tarte BB Tinted Treatment 12-Hour Primer is the ideal companion product for this foundation -- they work beautifully together. For the best application, I recommend, pressing the brush against the mesh to load up the bristles with foundation and then tapping it against the stopper on the lid to really disperse the powder throughout the brush -- and of course, tapping off any excess before buffing it into your skin. Right now, you can get the foundation and brush on the QVC website for the feature price of $39.84 and $4.97 s/h (plus tax). At some point, the price will go up to $43.50. All in all, I really like this foundation. I think I'll be using it a lot now that the weather's warmer. I recommend it for pretty much any skin type except the extremely oily and extremely dry if you like a natural finish and light to medium coverage. Have you tried the Tarte Amazonian Clay Full Coverage Airbrush Foundation? What's your favorite loose powder foundation? I've been wanting to get a powder foundation. I use to have Bare Minerals, but it did not work for me. So I am a bit skeptical when it comes to powders. I was watching Tarte on QVC and saw how the powder foundation covered the model's skin. How would this foundation compare to Bare Minerals? I would say it's lighter coverage than Bare Minerals and doesn't look as heavy on the skin. I actually prefer it to BM, but I don't really like full coverage powder foundations because I find they're difficult to apply without them looking cakey. I haven't picked this up yet since Maureen said that it runs darker than the Amazonian clay liquid foundation, so I was worried it would be too dark. I'll have to give it a try at some point, but I might wait until it comes to Sephora and I can swatch it/get a sample. I don't find the Fair shade to be that much darker in the powder than the liquid -- and I usually do have an issue with foundations being too darker. It is always best to test in person when you can, though. Thanks for the review was very helpful. Only for reference which shade are you wearing in MAC? NW-NC 15? I'am also very pale and I don't know if the FAIR shade at QVC is the same shade that the fairest one (FAIR HONEY) in Tarte web, Sephora,..etc.Thanks in advance. My best match in MAC is the Studio Fix Fluid in NW10 (I need to do a review of this one of these days!). NW15 is slightly too dark for me. Looking at Tarte's website, Fair Honey is supposed to have peach undertones. I don't think the Fair that I got from QVC has peach undertones -- it seems to lean neutral to my eyes. I find it really strange that they have a different set of shades for QVC -- all that does is lead to lots of confusion. Hi, nice review! Do you think the airbuki is necessary? Would the RT Expert face brush work the same considering they are both dense and small? I do not feel like shelling out another $30 for a little brush. Thanks! Oh, I don't think the airbuki is necessary -- if it hadn't come with the foundation when I purchased it from QVC, I wouldn't have shelled out the money for it separately. 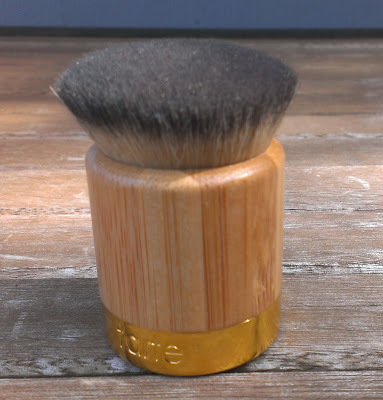 I think the RT Expert face brush would work well or any flat top kabuki style brush -- really any brush that you would use for mineral foundation in general. There's nothing particularly special about this one that warrants a specific brush, I think. The finish is absolutely gorgeous, though! It's been my go-to mineral foundation for the past year or so.